I finally wrapped my first Christmas present tonight... beer! First, I have to give credit where credit is due : THANK YOU PINTEREST (more accurately... thank you http://lifeofamodernmom.blogspot.com/2010/11/reindeer-rootbeer-beer.html). Seriously though, what would I do without pinterest? Well for starters, I would probably have a lot more time on my hands! HAHA. But 2. my gifts would be so much more boring. 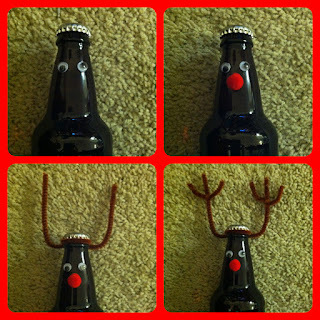 Beer reindeer are actually super, super easy. First, you need googly eyes, red puff balls for noses, and brown pipe cleaners. And something to attach them to the bottles with. They suggested a glue gun but I used some of my scrapbook adhesive.